Find out how training available from the Federal Highway Administration's (FHWA) National Highway Institute (NHI) can help you accelerate innovation and open new doors in your career with the 2012 edition of NHI Training in Action. The magazine spotlights how NHI courses and Webinars support the goals of FHWA's Every Day Counts (EDC) initiative, including shortening project delivery, enhancing roadway safety, and protecting the environment. The EDC initiative is designed to speed deployment of proven solutions and technologies. Courses available include NHI Training 131137, Special Mixture Design Considerations and Methods for Warm Mix Asphalt. One of the EDC priority innovations, warm mix asphalt (WMA) encompasses a variety of technologies that allow asphalt to be produced and then placed on the road at lower temperatures than the conventional hot mix asphalt (HMA) method. The lower temperatures may result in cost savings and reduced greenhouse gas emissions because less fuel is required. Other benefits include improved pavement performance, reduced energy usage, and increased worker comfort. 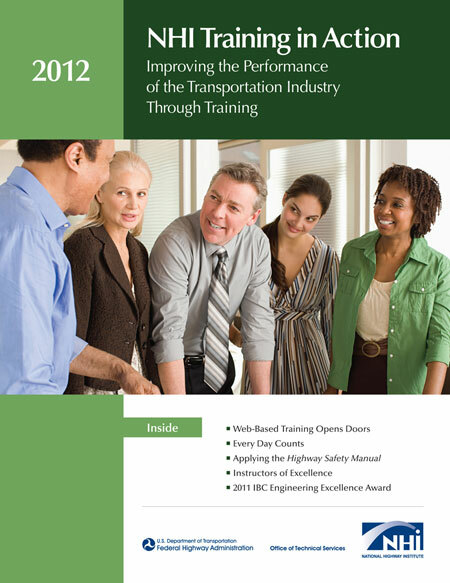 The free 2-hour online training highlights key differences in WMA and HMA design procedures (see December 2011 Focus). Participants also have the opportunity to convert HMA mixtures into WMA mixtures. Another course that complements the EDC initiative is NHI Training 142060, Practical Conflict Management Skills for Environmental Issues. This 3-day training equips transportation professionals and their counterparts from local government, tribal entities, and environmental organizations with critical interpersonal skills and the ability to work efficiently and effectively with all stakeholders in the arena of transportation planning and project development. The course contributes to EDC's goal of reducing the environmental footprint of transportation projects. NHI Training in Action also looks at how Web-based training opens doors. NHI now offers more than 100 Web-based courses, most of which are free to participants. One course participant credits the online training with helping him obtain his current position with the Utah Department of Transportation (UDOT). "The Web-based training component makes 24/7 accessibility a reality, which is another great benefit for today's busy professionals," said Rod McDaniels, program manager for outdoor advertising control at UDOT. Additional features report on how NHI courses are helping practitioners use the American Association of State Highway and Transportation Officials Highway Safety Manual, as well as the International Bridge Conference Engineering Excellence Award received by FHWA for the new NHI reference manual, Analysis and Design of Skewed and Curved Steel Bridges with Load and Resistance Factor Design. Also included is a list of NHI courses launched in 2011. To download the 2012 NHI Training in Action or for more information on NHI training opportunities, visit www.nhi.fhwa.dot.gov.